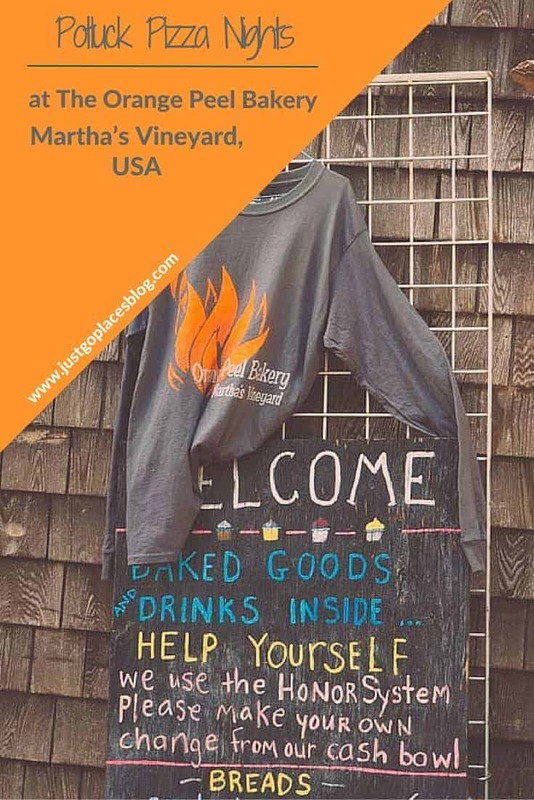 In recent years, Martha’s Vineyard has become associated with presidential vacations, multi-million dollar homes and a short-lived reality television show featuring beautiful rich blonde kids. Co-existing with all these things, the Vineyard I know and love is a less-flashy and more laid-back place. Even if the people you meet are trustafarians, you wouldn’t know it from their lived-in shorts and dust-covered cars. 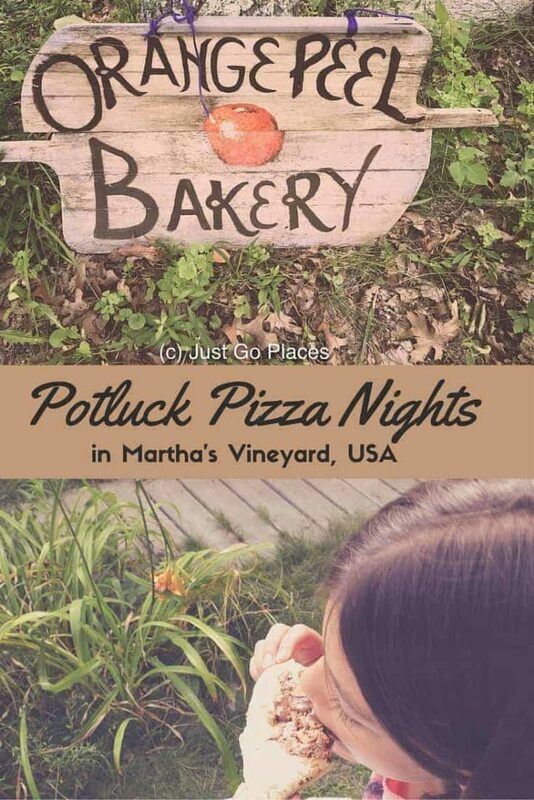 For a quick blast to the hippie past, the Orange Peel Bakery’s potluck pizza night invokes the hippie spirit of Martha’s Vineyard. The Orange Peel Bakery still uses the honour system for payment. In the 1960’s, the hippies washed ashore onto Martha’s Vineyard much to the early distrust of the local islanders. At least the Vineyarders were more welcoming than the people of Nantucket though who had a strict policy of sending hippies back to the mainland. In 1969, Martha’s Vineyard came on to the national consciousness briefly when a young (and married) Senator Ted Kennedy had his car accident on Chappaquidick which killed both his female friend and his chances at the US presidency. Luckily, the scandal referred to Chappaquidick by name. 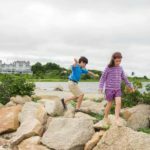 Many people do not associate Chappaquidick with Chappy, the local’s name for the occasional-island that is across the harbour from Edgartown in Martha’s Vineyard. The hippies of Martha’s Vineyard bobbed along in the 1960’s and 70’s stream happy in their own drug-filled haze and music. Some of the young people had grown up summering on the Vineyard, while others were on-island more by luck than judgment. For example, one name you hear often is that of Peter Simon, a photographer who still lives on the island. Peter is the little brother of Carly Simon and son of the man who founded Simon & Schuster publishing house. He grew up spending his summers in the Vineyard. 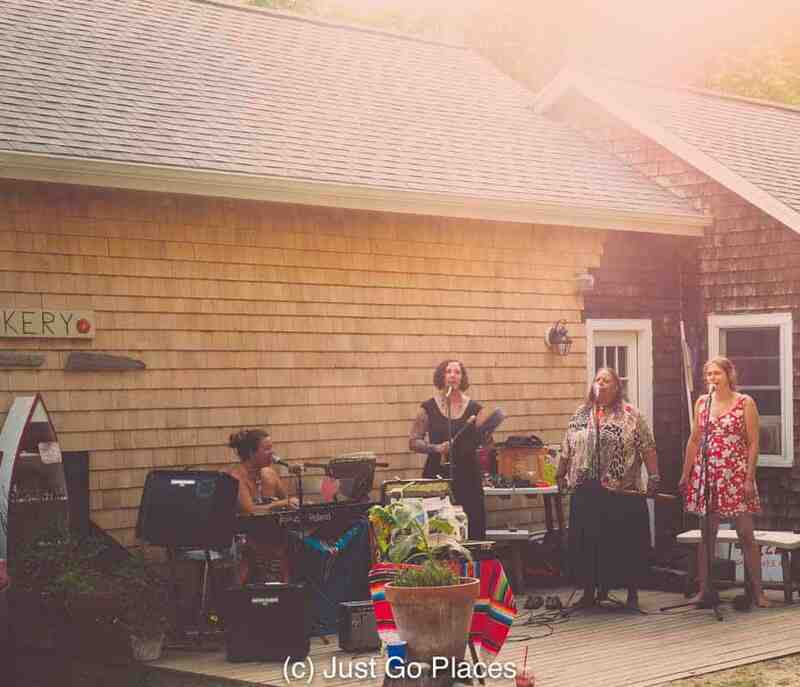 In any event, they all got into feeling groovy on Martha’s Vineyard. Like all youth movements though, the hippies grew up. They eventually got jobs, got married and had kids. The liberal free-spirit of the hippies is still alive and well in Martha’s Vineyard even in these days when hipsters have replaced hippies. A part of Moshup Beach near Aquinnah is still unofficially clothes-optional. Many people don’t lock their homes and cars. 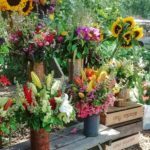 You see lots of farm stands, flower stands, etc by the side of the road which are run on an honour box payment system. What do I love about the Vineyard? It’s not a ‘scene’ like the Hamptons. There is next-to-no nightlife in the Vineyard. Even the island’s most happening nightlife at Oak Bluffs is pretty lame compared to other places off-island. The real action happens at dinner parties in people’s homes. Sure, there are the famous and wealthy people sprinkled around the island. They get to blend in because there are so many of them around. Bill Clinton was famous for playing the saxophone at the bar at Lola’s in Oak Bluffs. We stood in line behind the Obama kids at an ice-cream store. When their secret service agents asked if they could jump the queue with their charges, they were politely refused. They were forced to stand in front of me and the 6 over-excited-about-ice-cream-and-oblivious-to-anything-else children I had with me. I can tell you the noise levels were pretty high. Bwahaha. The handyman who comes to help repair our screened porch regularly (because the kids kick the screen every single time they open the door) is an ex-hippie who still wears tie-dye and cut-off shorts (unironically). He’s happy to regale us with (occasionally cringe-worthy) tales of the island’s free-wheeling past. Nice guy, but I’m pretty sure a chunk of his brain was baked years ago. I was reminded of this spirit of communal living when we went to have dinner at the Orange Peel Bakery in Aquinnah. 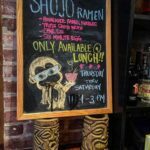 The owner, Julie Vanderhoop, is a member of the Native American tribe that were established in Martha’s Vineyard long before European settlers came to the island. 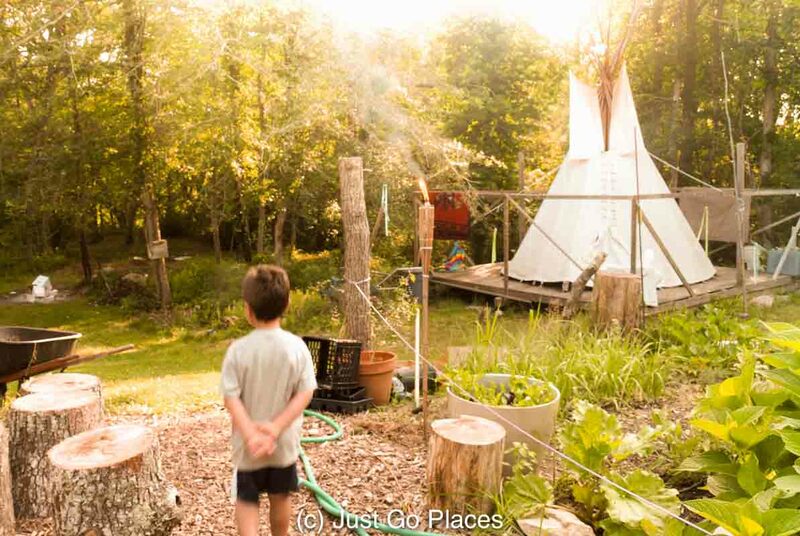 My friend’s little boy was desperate to go into the Native American teepee in the back yard but that was off-limits. 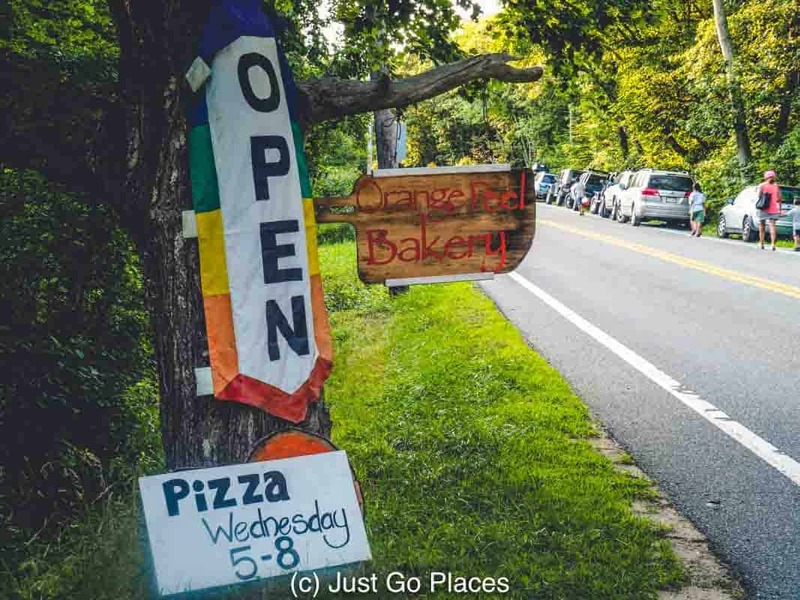 Although the main bakery is in Aquinnah by the cliffs, we went to the very popular, bring your own topping pizza nights run by the Orange Peel Bakery on State Road. A mailbox is the first sign that you have found the place. When you pull up to the address on State Road, you think you are entering someone’s house party. In front of an ordinary Vineyard house, people in deck chairs are sprawled across the lawn, children are running about and music tinkles over the scene. The actual pizza making process is organised on the side of the house next to the giant stone oven. The oven is lined on the inside with French clay and the outside with local Aquinnah stones. People are sprawled over the lawn eating, drinking and conversing while the music plays. Pick yourself up a pizza crust with sauce and cheese and then head on over to the toppings table. Put on your own toppings or help yourself to someone else’s toppings. Then you hand the pizza over to the person operating the very hot stone oven. Soon you will be rewarded with piping hot pizza of your own creation. The person slicing the pizza will give you half the pizza, and the the other half of the pizza will be donated to anyone else who wants it. You can repeat the process as often as you want (or until the dough runs out!). The rules are simple. 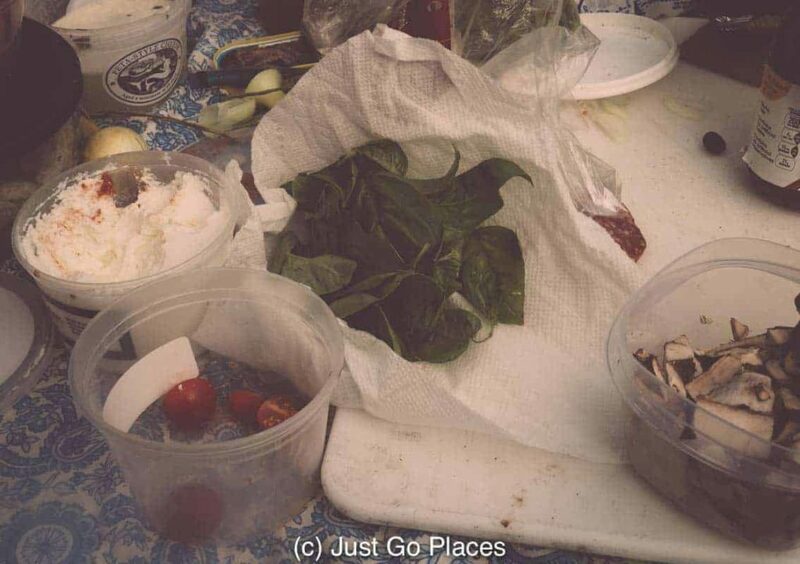 You bring whatever pizza toppings you want. Everyone’s pizza toppings are shared. Bring chairs if you want or a picnic blanket. It’s a good idea to bring drinks as well. Hang out, eat pizza and talk to your neighbours. Lots of people come straight from the beach. Our children loved making their own pizza. They also tried pizza combinations they would not have otherwise tried because the toppings were there. One unexpected delightful combination was a s’mores pizza – pizza base (no cheese or tomato sauce!) with marshmallows, Hershey’s chocolate and brown sugar. My daughter was very pleased with her pizza creation. 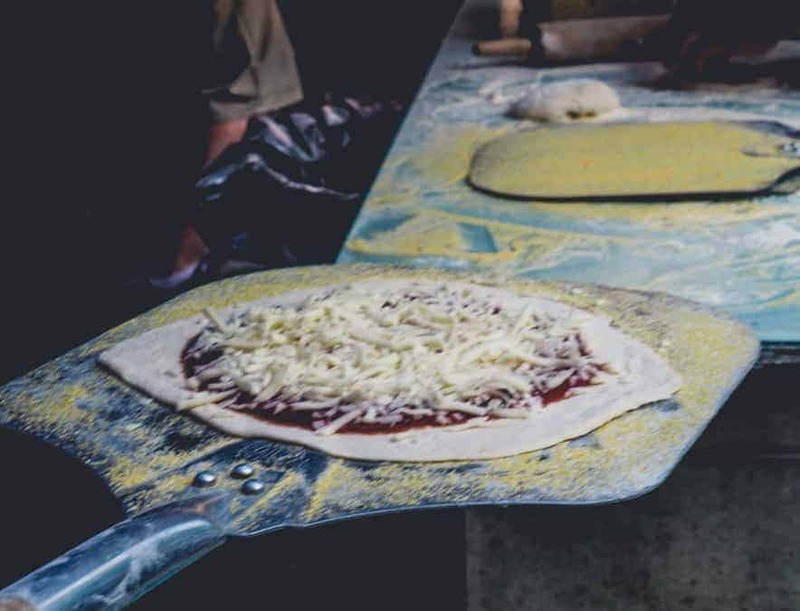 Pizza nights are run on Wednesday and Friday nights this summer at 22 State Road and cost $15 per adult and $10 for children. The money is put into an honour jar. 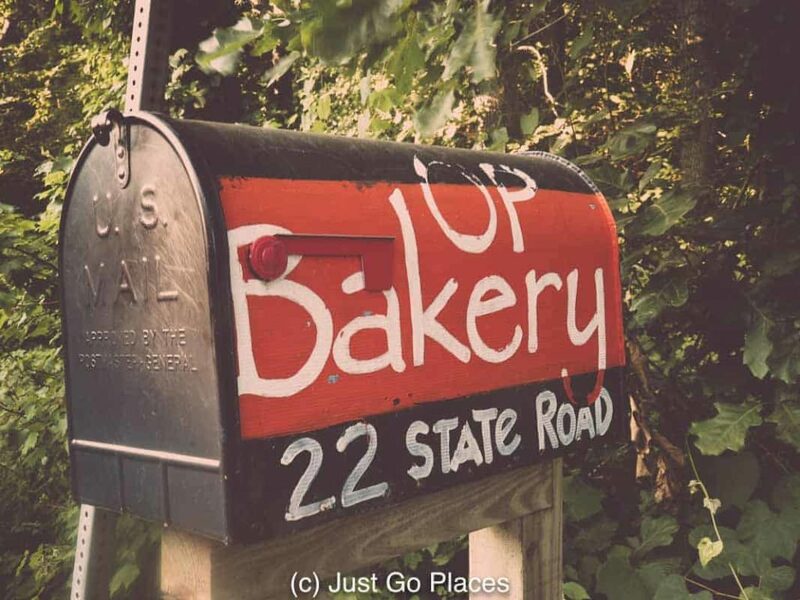 Check online with the Orange Peel Bakery because the days may change. We are being less Type A, remember? 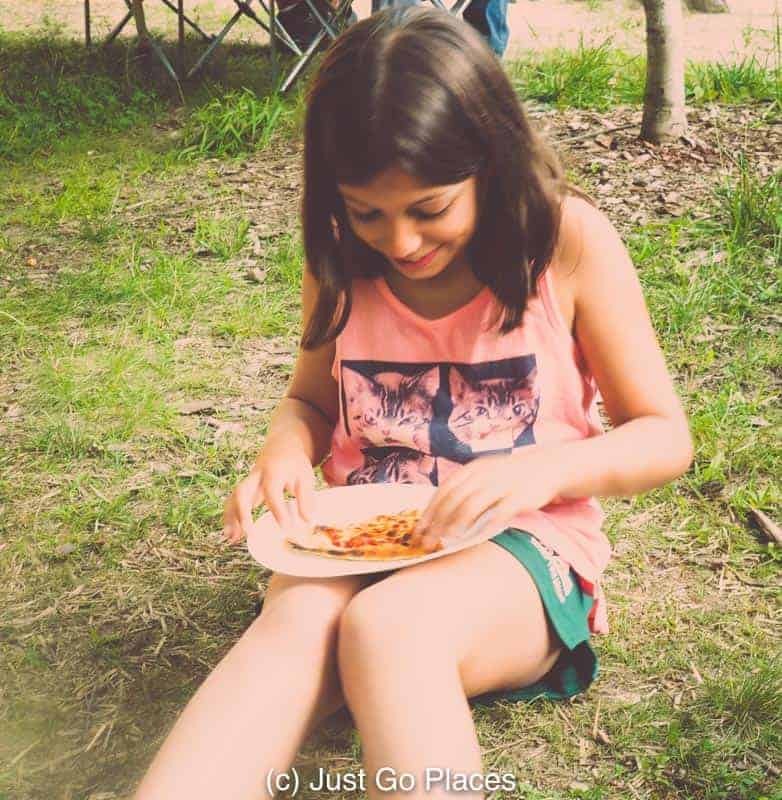 My daughter tucking into a dessert pizza – S’mores pizza is made of a pizza base with marshmallows and hershey chocolate. A sign indicates pizza night is happening! People park on the side of the road. The seashell-strewn drive looks like many other homes on the island. 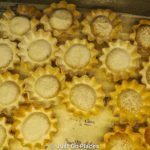 The bakery is known for it’s freshly baked goods. A pizza base ready to be bedazzled with toppings. After pizza, our kids played in the back yard of the house. 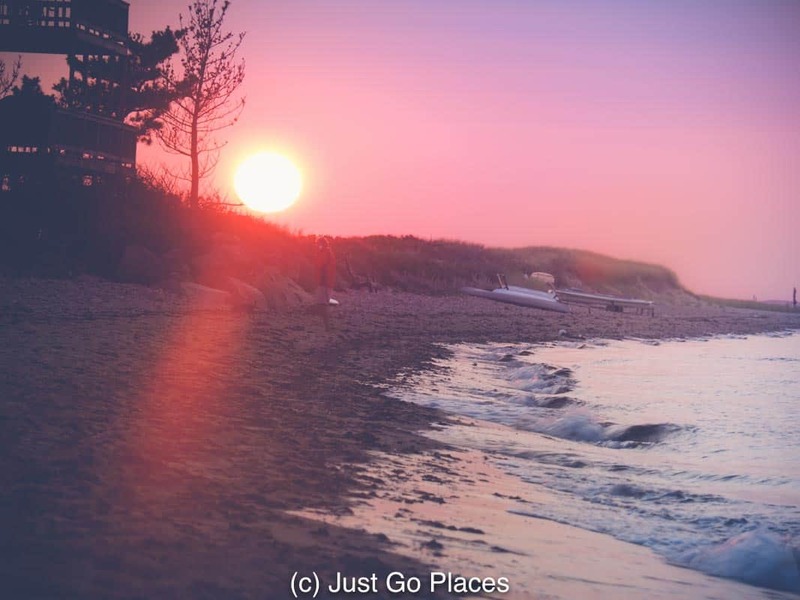 After pizza, you should try and catch the sunset in either Aquinnah or in Menemsha. 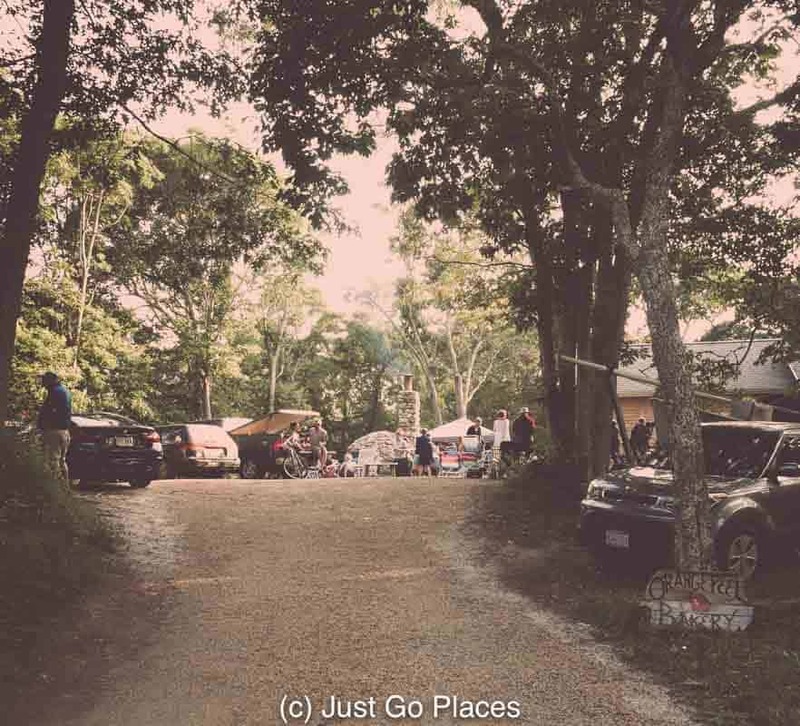 Aquinnah cliffs are a bit further up the road, and Lobsterville Beach is the next turning after the Potluck Pizza at 22 State Road. If you go back down-island a bit, you will come to Menemsha beach. Today’s sunset is brought to you by the colour pink. It’s the perfect ending to a perfect day on Martha’s Vineyard. Bonus: If the kids aren’t tired before, a bit of running around on the beach before dark will definitely get them there. I love the communal nature of the pizza potluck, and the payment honour system. Sounds like a relaxing way to enjoy food and get to know the people around you. It does have a nice community feel! 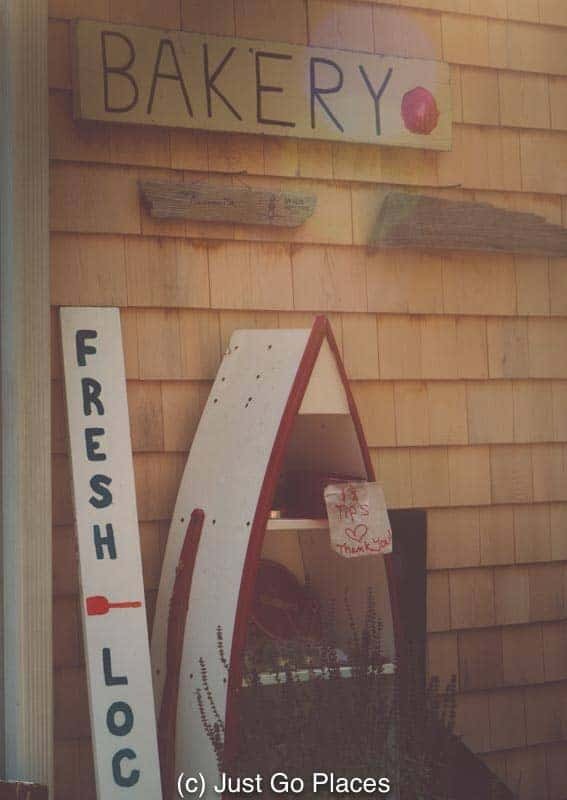 I had no idea that Martha’s Vineyard had such a beautiful and fun history. I have never visited, but have heard it referenced too in many a Hollywood blockbuster. I love the pizza idea a whole lot, totally the best way to eat and experience food huh? I love the idea of bring your own topping! And it looks like a really cool atmosphere! I’ve never heard of this before and it is pretty inspired! That is a very cool idea, the bring your own toppings thing. What a nice experience all round, it looks like an amazing setting! You have totally blown the image of Martha’s Vineyard that lived in my mind – in a good way. Glad to hear! It’s a diverse place but not the way its popularly portrayed. I never realized there was a history between hippie spirit and Martha’s Vineyard. what a fun event and way of organizing it. Great pics. So fun! I love the island’s “free wheeling” past. It’s still quite liberal just more discreet. This sounds like such a fun night! 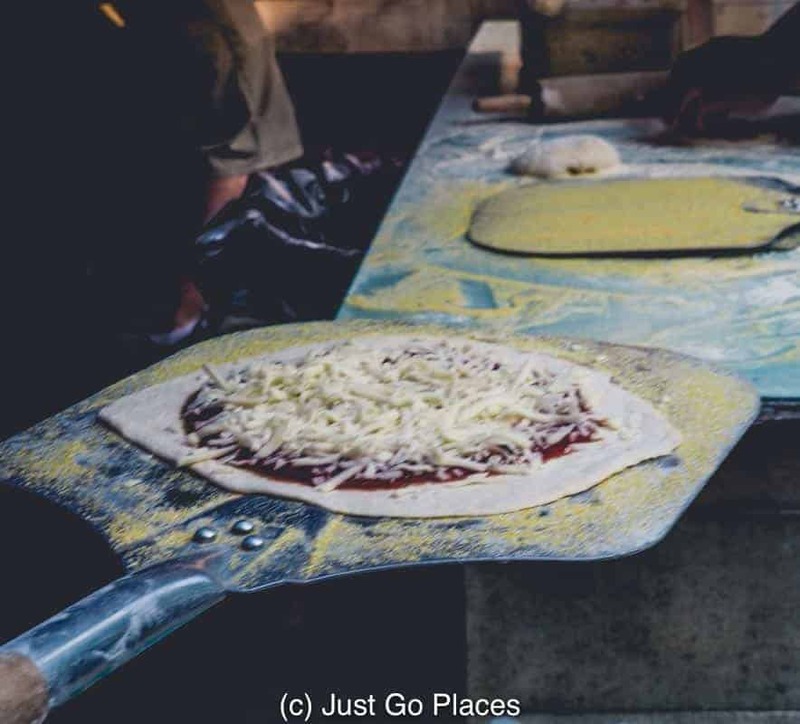 I would love to make my own pizza creation and I love the hippie vibe. This is such a great idea. Looks like you had a nice feast and a good time! Tara recently posted…Solving the Andaman Wi-Fi Riddle once and for all! We did! Thanks for stopping by. 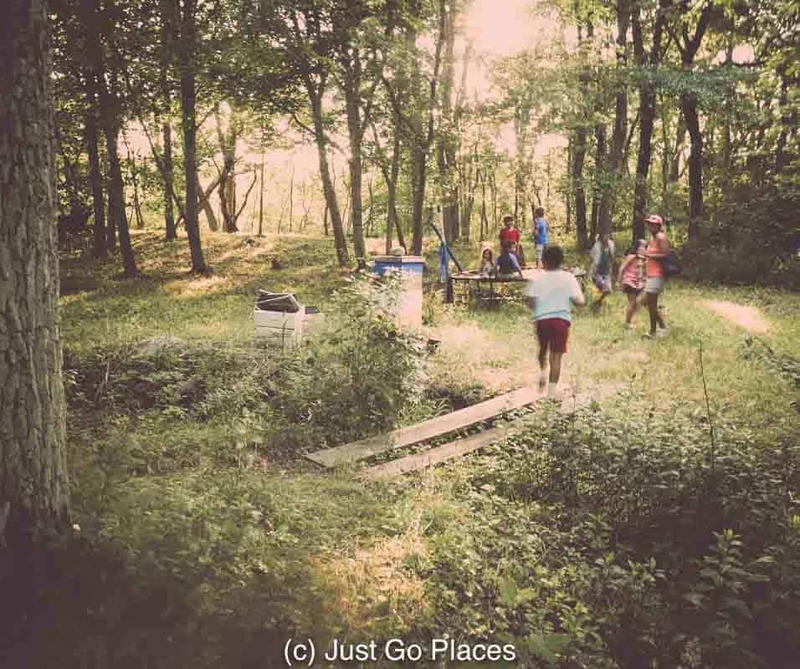 Looks like such a fun activity in a gorgeous place. I had no idea Martha’s Vineyard had this history. Such a fun thing to know. I have steered clear bc I thought it was only for the rich and famous! They are the ones who get the press! It’s a beautiful place and laid back if you just want to hang out and doesn’t care who is who. Sounds like so much fun! I’ve never heard of such a potluck before. 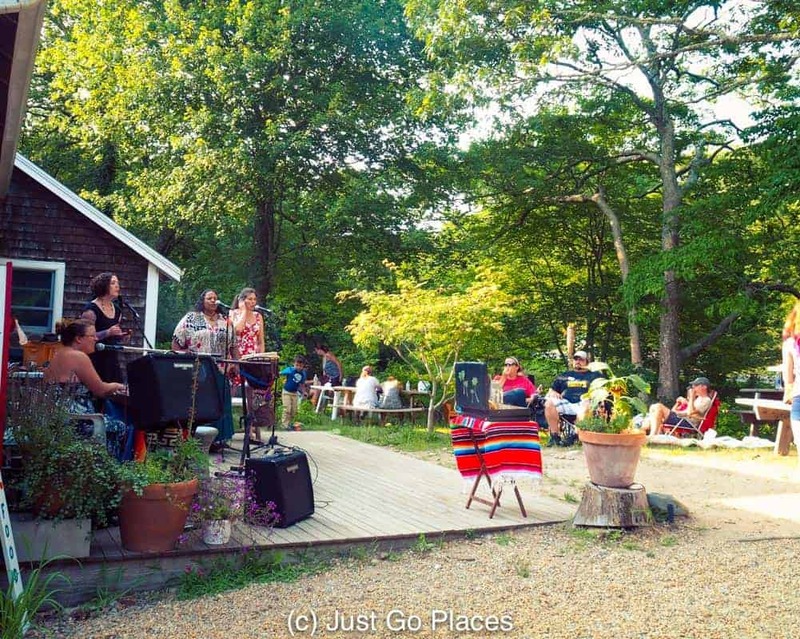 I might have to host one at my house… I loved reading about the historic hippie vibe of the Vineyard. I’ve been there only once and definitely did not pick up on it.